Apply current technical concepts and practices in the basic knowledge domains of IT. Define the requirements needed by organizations to address problems and opportunities faced by them. 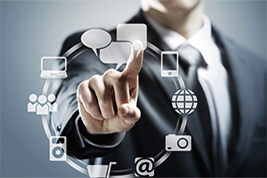 Design effective IT based solutions and to integrate them into the user environment. Evaluate technologies and their possible use within organizations. Also analyze their impact on individuals, organizations and society as a whole including ethical, legal and policy issues. Understand best practices and standards including how to apply them. Acquire independent critical thinking skills. Collaborate in teams to accomplish a common goal by integrating personal initiative and group co-operation. To communicate effectively and efficiently with clients, users and peers both verbally and in writing, using the appropriate terminology. Recognition of the importance of lifelong learning. Selection, creation, application, integration and administration of computing and networking technologies. This program provides the graduates with the skills and knowledge to help them in the acquisition of appropriate careers after graduation in the field of Information Technology. It can also help them in pursuing research or graduate studies in this field. Moreover, with the basic background they acquire, they can follow up technological advances and carry on a lifelong learning career. Apply the appropriate IT and methodologies needed for organizations to achieve their goals and manage their resources. Absorb new developments in IT and assess the needs of the organization from such advances in a proactive manner. Be able to contribute to the scientific and the theoretical foundations of IT. Dr. Manal Ahmed Ismail Shoman is a professor of Computer Engineering at Helwan University, Faculty of Engineering. She received her PhD Degree in Computers and Systems Engineering from the Faculty of Engineering, Ain Shams University, 1996. Currently, she is the Director of Information Technology program at Egyptian E-Learning University (EELU). She held a position of Director of Information Technology Center at Helwan University for 5 years. She was Project Manager and PI for Helwan University Management Information System Project, Feb. 2006 till 2009. She was Vice-Project Manager of "Enhancing the Use of Teaching Technologies and Facilities at Helwan University" financed by the Egyptian Higher Education Enhancement Project Fund, aiming to enhance the abilities of Helwan University staff members to use computers and multimedia in teaching and converting their teaching materials into electronic form (September 2004 - September 2006). She is the author and co-author of more than 35 research papers in international conferences and academic journals.